Spoiler Warnings: Don't read on if you don't know anything about the Winter Soldier and want to go into the movie cold. Just bookmark this post and read it once you've seen the movie! In many ways, The Winter Soldier is the little superhero concept that could. Bucky Barnes, the World War II sidekick of Captain America, had been dead since before the war ended, a victim of the same accident that tossed Cap in the ice. (In the movies, it's similar — Bucky falls to his "death" just a few days or weeks before Steve Rogers plunges into the ice.) When Cap was brought back into the Marvel Age in 1964, Bucky stayed dead as Stan Lee, for one, was against the concept of kid sidekicks in general. This isn't surprising considering that a kid sidekick's primary narrative purpose is really just to give kids an identification point, and this was certainly at odds with Marvel's objective to deliver a more "realistic" product. 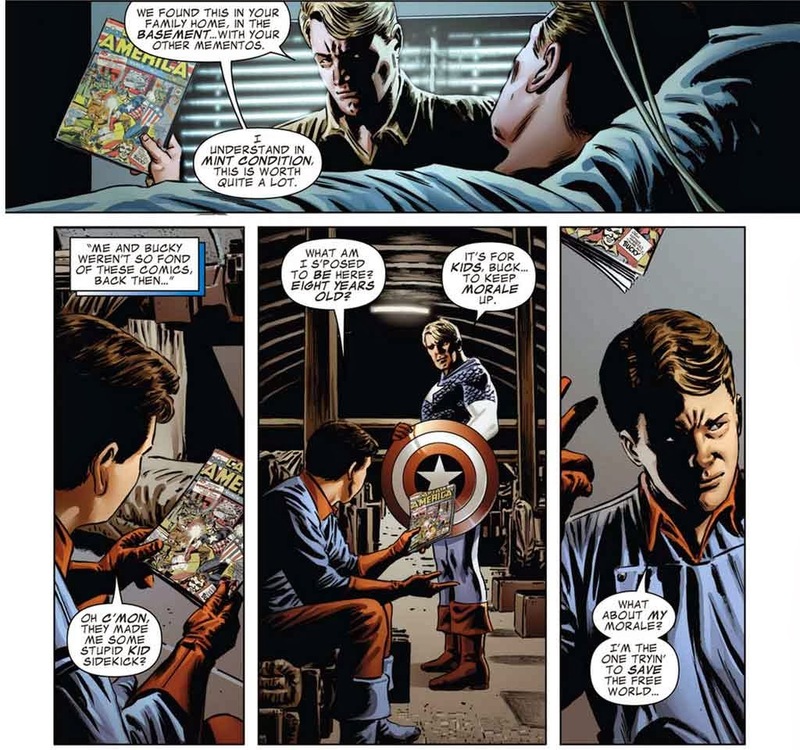 Bucky's death also provided Steve with a pathos that kind of helped to carry him for a bit in his initial Silver Age run. Over the years, a kind of "rule" came about in comics fandom, especially as resurrections became more and more common. That rule saw a lot of variations over the years, but the gist of it was that "Only Bucky stays dead." (Some variations include "Only Bucky, Jason Todd, and Uncle Ben stay dead" and "Only Bucky and Gwen Stacy stay dead.") It's an exaggeration, of course, as a lot of characters have to stay dead to remain effective, such as Batman's parents and Spider-Man's uncle, but the point is, for a very long time, it was just accepted that there was no bringing Bucky back. Like Bucky, Brubaker was a military brat, but Brubaker states that he just simply liked the idea that next to a super-soldier was a "well-trained kid with a machine gun and an attitude." So when Brubaker got the assignment of writing Captain America in 2004, he wanted to bring Bucky back. Fortunately for him, and for comic book readership in general, then-editor-in-chief Joe Quesada was behind him all the way, giving him Steve Epting (his first choice) for an artist, and lining up other artists with similar styles, such as Michael Lark and Butch Guice, to maintain a visual consistency whenever Epting needed some help. The result is one long story that could easily fill up an entire bookshelf, with a clear narrative and visual flow. This is impressive in and of itself, but especially if you realize that it involves the return of Bucky. 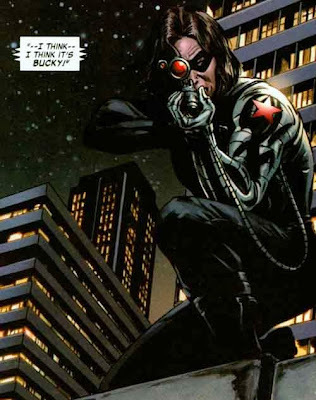 Bucky, for whom there existed a no-resurrection rule until they decided it was time to break it. Alan Moore, apparently, was criticized for changing too much of Swamp Thing, but as he points out, "Unless I understood the tradition of Swamp Thing, how could I ever come up with exactly the right sort of twist to put in them?" 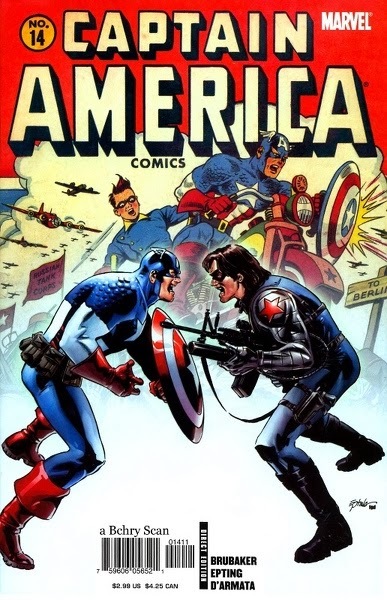 In that vein, you can tell that Brubaker was a fan of both Captain America and Bucky because he was able to find just the right twists to put on the story — which is actually highlighted more when you consider the fact that at pretty much the same time, DC Comics brought back Jason Todd, the second Robin, in a similar plotline where he was after Batman. Two similar controversial premises, and one is now going to be a big blockbuster movie while the other one, while not largely forgotten, has more receded in significance after nine years. Brubaker's twists were just right and, in many ways, so blindingly obvious. Bucky Barnes was a kid who ran around with Captain America, so he could keep up with a super-soldier. Logically, that just makes him the greatest natural fighter that's ever been born. Bucky carried a machine gun around, whereas Cap did not, so he did the dirty work that Cap, as a symbol and point of morale, couldn't do. These were so obvious and such easy ways to get past the perceived "lameness" of Bucky. In fact, just by introducing those elements, Bucky immediately goes from "stereotypical superhero lame sidekick" to someone you absolutely have to respect and a very real threat. Here's a twist I really like. In the Marvel Earth, Captain America Comics #1 is, ostensibly, the same as the one on our real Earth. It's the official cover story for wartime Marvel Americans, and the twists Brubaker put in (Bucky wasn't a kid anymore, for example) made it so that the "real" Cap #1 has more in common with that cover story than the actual story being told. 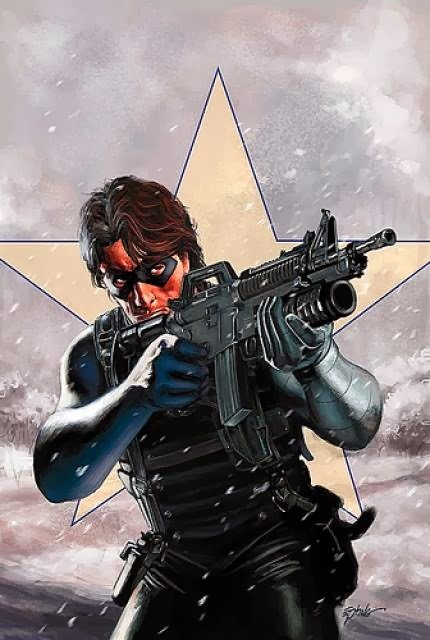 So when Brubaker begins his run and all this backstory with Bucky is filled in, you realize what a threat he really is and really can be when he shows up as the Winter Soldier. Fished out of the ocean by the Soviets and brainwashed into being their assassin, kept young by cryogenics in specific periods over the years, the Winter Soldier remembers nothing about his past, but his muscle memory is intact. With his left arm replaced by a cybernetic prosthetic, Bucky has become one of the very few people that can pose a legitimate threat to Captain America. And you know, that's good stuff. After years of Steve beating himself up over Bucky's death, it turns out Bucky's alive, and suffering a fate that might be considered worse. When Bucky finally does get his memory back, his actions as the Winter Soldier don't leave him, and he's haunted by guilt. He eventually ends up having to take over as Captain America in the much-publicized "Death of Captain America" storyline a few years back, and that gave us some pretty good stories until Marvel put Steve back in the uniform. 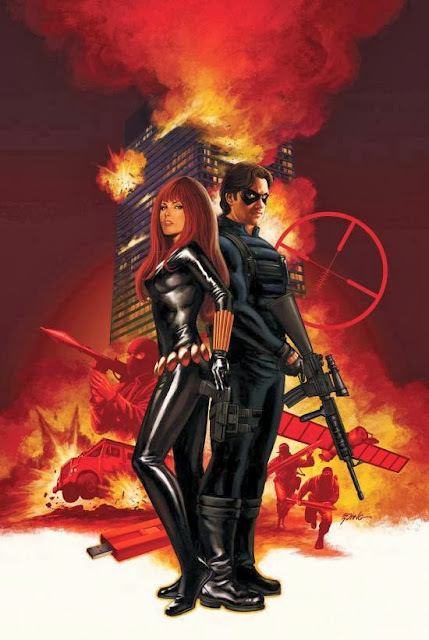 Still, Marvel, Ed Brubaker, and company managed to make Bucky Barnes/the Winter Soldier a viable character moving forward, and The Winter Soldier storyline is now the basis for the upcoming movie. That's the first time ever that a Marvel-produced movie is directly based on just one specific storyline instead of being an amalgam of multiple storylines. Somehow, The Winter Soldier has taken the steps to become an evergreen book. wondering why Natasha/Scarlett was in the movie. Considering that it all revolves around a character that the comic book industry and fandom long regarded as unusable, I'd say that's pretty impressive.